Red Admiral is a very attractive butterfly belonging to the family Nymphalidae. It is distinguishable with its velvety black wings with a red band. They are considered a people friendly butterfly. Red Admiral is a medium sized butterfly with velvety black wings intersected by a red band and a red border at the bottom of the wings. The coloration of the band varies between dark to orange red. The tip of the forewing has several white spots. The underside of the hind wing however is mottled grey and green. 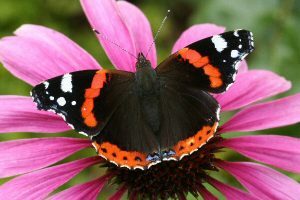 The wingspan of the red admiral is 45 to 57 mm. The caterpillar is black to greenish grey with a yellow strip along the sides. 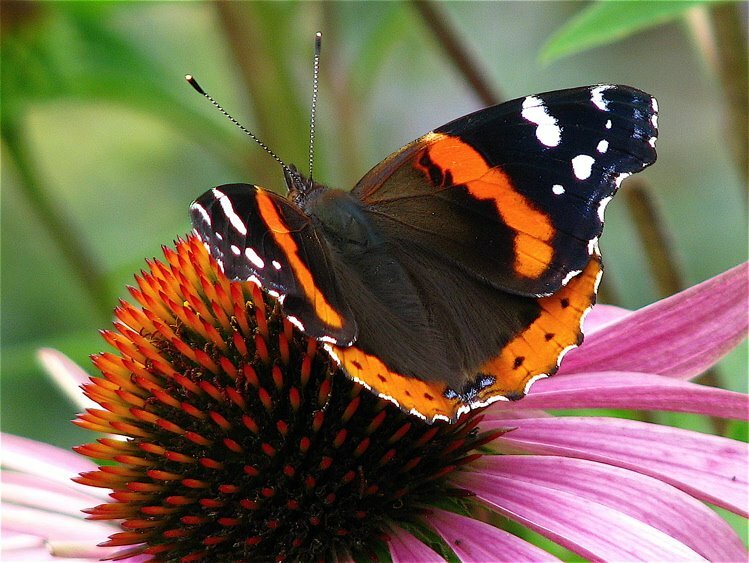 Red Admiral is found in warmer areas, through Mexico, United States to North Canada, from Newfoundland to Churchill, Manitoba, Hawaii, New Zealand, Caribbean Islands, Europe, Northern parts of Africa and Asia. Red Admiral is primarily a forest butterfly however, they are found everywhere from mountains, sea-shore, town gardens, moist fields, marshes and parks. These butterflies are territorial. 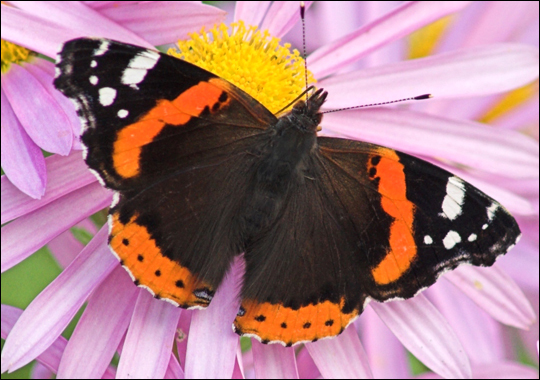 Red Admirals fly during the day and are known to fly at night too. They are territorial butterflies and the males compete for the females. These butterflies are human friendly and often perches and lands on humans. The life span of the winter generation Red Admiral is about 9 months and that of the summer generation is about 4 to 6 months. The primary host plant for the larvae is Common Nettle; it would feed on any of the species of Nettle. It also weaves a shelter for itself to save themselves from the predators. The Red admiral butterfly feed on the nectar of Fleabane, Bramble, Honeydew, Privet, Thistles and Teasel. Red admirals feed on the fermenting fruits, sap flow of the trees, bird dropping and if these are not available, they prefer the nectar of flowers like milkweed, honeydew, aster, red clover etc. Red Admiral males are very territorial when they are breeding. They select a sunlit spot and courts a female if he spots any, if he spots a male; it becomes aggressive and compete for the female. The first stage of the Red Admiral lifecycle is the egg which is laid on the food plant like Nettle or Pellitory. The eggs are very small, less than 1mm. They are light green initially but start getting darker as the larva develops. The eggs hatch in about a week. The second stage in the life cycle is the larva. This stage last for 2 to three weeks, depending on the temperature. The larva joins the leaves together forming a tent for itself and emerges just to feed. A full grown larva is black, however, in its growing stage; it may be greenish brown to a yellowish green colour. The third stage of the Red Admiral life cycle is the pupa. Chrysalis protects the pupa. They are grayish yellow to brown with metallic spots according to the environment, to provide camouflage. This stage, depending on the temperature last for about 2 to 3 weeks. The final stage, the butterfly emerges out of the pupa. It hangs from the pupa for almost 2 hours, until their wings are dry. 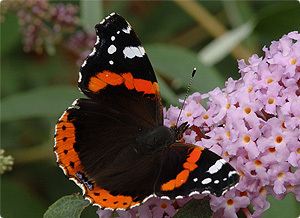 Red Admirals are widespread butterflies. They are known to hibernate during the winter season. The ones in the north are usually migrated from the south. Their predators include large insects, birds, bats, spiders and wasps. Red Admirals are not considered an endangered species. Red Admiral butterfly signifies spirit or souls. For some culture it symbolizes transformation and resurrection. However it is also associated with a short concentration span or the one who flips through interest easily. Since the butterfly can camouflage themselves easily, it can also signify things which are hidden and not as they appear. Here are some of the pictures of this colorful butterfly. How do you find monarch caterpillars? What is the best way to find them? When I look for them, I can’t find them. I only find where they have fed off the milkweed.